I’m taking a virtual walking tour ‘above ground’ on the London Underground. Using my Tube guide and my fitbit® device, my goal is to walk at least 10,000 steps a day roughly following along the Underground route, reporting back here on Fridays with my findings. This is Day 11. I feel like one of those quasi-detective types in a old-fashioned book. On the cover there’s a group of three people—two men and a woman is the usual mix—all leaning over an oak table covered with historical documents. A lamp casts its glow on a map, a few old photos, identity papers. A mystery is afoot! After getting that initial email from my cousin Sean last week—up to now, a virtual stranger—suddenly I’m diving into my family’s British history, pulling old photos and clippings out of worn manilla envelopes. Trying to piece the past together. Last week I learned that my grandfather, who I was vaguely aware had served in World War I, was wounded three times in the Great War. At Ypres, Flers and lastly at Gallipoli. At Gallipoli Pop was hurt so badly he was hospitalized for six months and almost had his arm amputated but a pretty nurse prevailed on his behalf. To be honest, she may not have been pretty but doesn’t it sound better if she is? His brother, Ernest served too, as a gunner in the RFA. I zero in on the caption beneath the tiny photo of Pte Hayden. I immediately picture my great-grandmother, worried that she hasn’t heard from her husband, putting a personal in the newspaper, asking him to write home, hoping he’ll see it. I share my theory with Sean who says the address is probably listed for those who want to send condolences. Bloody fool, my father would admonish me. 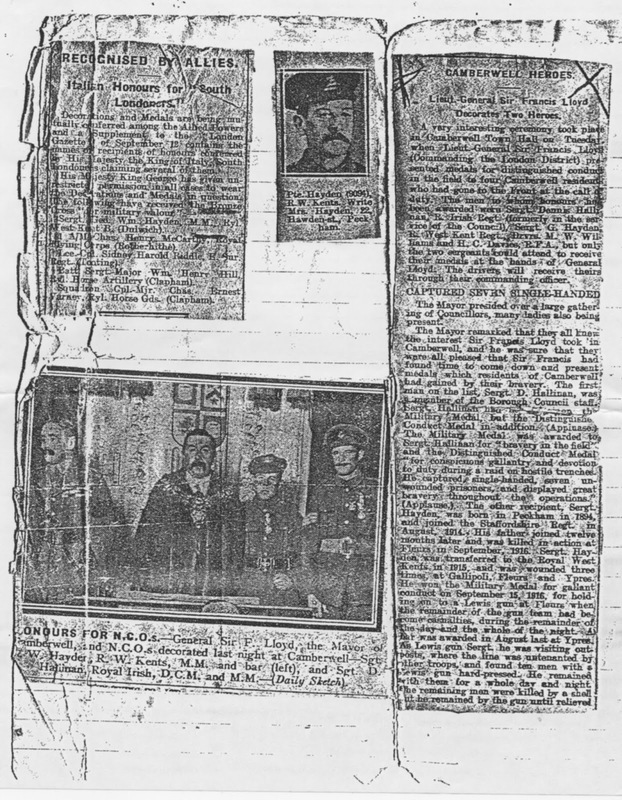 My great grandfather wouldn’t need to see his own picture , to read his own address published in a newspaper to know where to write. Sean’s version makes more sense, of course it does. Still when I find copies of two letters my grandfather wrote his mother just five days after that September 15th battle, I can’t help but see her wringing her hands at the window of #22, waiting for word. The first one is dated 20.9.16, in the British manner. Just a few lines this time to let you know that I am quite well. Now the task I have in front of me is a rather hard one. It was on the 15th that the Batt. (battalion) had the order to take the German trenches and so at dawn every man got out of our trenches and made the charge and from the moment that happened I did not see Dad again. But when we had successfully beaten the Huns and were relieved again I made enquiries of various people and I am led to believe that he got wounded and was sent back with a slight wound. I sincerely hope this was so as I can get no more definite news and the Batt. Orderly Room say that they will not know until tomorrow night, but I thought I would let you know in case you have not had any news yourself. As soon as you know will you please let me know. There isn’t a signature. The other letter was written five days later, on 25.9.16. I have a long letter to write this time as I have 3 in my pocket from home, one from you and one from Rosie and the last is for Dad from Flo. Now you see, as Dad is not at present in the Batt., I get his letters and I have had them all to date including PO’s. Now a week ago I wrote and said that Dad had been wounded but I did not know where he was as that was the last time he was seen on or off the “Battlefield.” I have been waiting for your reply to that letter and anxiously at that, so I am hoping to get a letter back today. So anything you may not understand my saying will be fully explained when I can get your letter to me answered. Now the official list has just arrived with the Casualty list of the 15th., when we made the attack so successfully on three lines of “Enemy” trenches, although as of course you will readily understand, paying for it. On the list was Dad’s name and marked beside it was missing, as I dare say you have already been informed by the War Office, but dear you must not worry for the sake of your own health. I am not allowed to say very much and in fact I should not have said so much because the War Office get so many enquiries as to whether the casualties are correct that the fellows in the Batt. write about. My dear ma, I am sorry to say I did not get the parcel you sent with the tooth-brush, cigarettes and pipes in so it must have got mislaid during the time we were in the line. I hope by this time you have got some good news of Dad. I am glad to say that I came through without a scratch — Heaven above knows how, but I suppose it was to be and I thanked God as did all the others after the battle was over. They never heard from dear old Dad again. It was sent to the same address, #22 Howden Street in Peckham. There she is, sitting at the window, watching the street for the postman, for the War Office, for someone to come and give her the news. Eventually she will learn that not only did she lose her husband to the Great War, she also lost Ernest. He suffered from shell gas poisoning, probably mustard gas, probably dying from it. 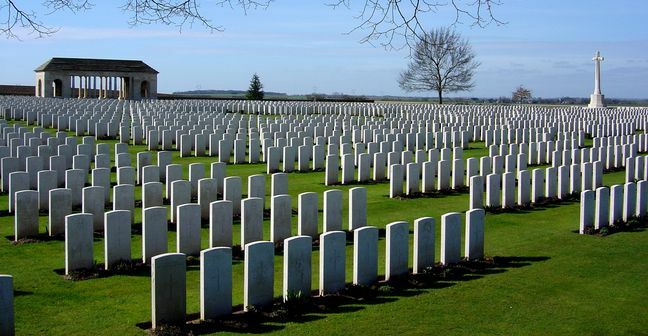 Digging around online, I discover something called the Commonwealth War Graves Commission, a website set up to help you find where dead veterans are buried. My great-grandfather, I learn, is buried—reburied, actually, his remains found elsewhere—at the Guard’s Cemetery at Lesboeufs near the tiny village of Comble, not far from the banks of the Somme River in France. Almost three thousand men are buried there, most of them young men like my grandfather, who was lucky enough to live, but they, like my great-grandfather, the unlucky ones who had to die. There’s a certificate that lists exactly where within the graveyard his remains can be found. Next year will mark the 100th anniversary of that historic battle and of my great-grandfather's death. I expect there’ll be some sort of ceremony to mark the occasion. Maybe as I take this virtual journey it’s time to plan a real trip to both England and to France to pay my respects. For now, I check my google maps and locate #22 Howden Street in Peckham. It’s still there. I don’t know if it’s the original structure or whether that house was blown to smithereens in the blitz in WWII but it’s there. I put on my best Merrills and make the 11 mile trek cross town. It takes me about four hours but there it is, the mellow tan and brown bricks, a small bay window, a shiny pale blue door. If I squint I can almost see a woman up in the second story window. Her hair is pinned up, she’s wearing a navy and white striped shirt-waist. She’s reading a letter, it just isn’t the one she was hoping to get. I'm quite convinced that all nurses in WWI were pretty. Every book I've ever read described nurses that way. Your clippings and letters really bring this time alive. I'm so sad for these people, your family. What an awesome adventure you're having! Was this what you expected when you started? Great story! It must have been so hard for everyone not to know what was going on with their family members. Thnx. No, Joy, this isn’t what I expected at all. I wanted to visit the house I was born in but I had no idea about the family history that went before. My cousin emailing my brother and I after so many years was a shock, and has led to so many interesting discoveries. I think we all have fascinating family histories, I wish my mother had shared hers with me when she was alive. Wow. Sim that is fascinating information you found about your grandfather and great grandfather. Your great grandfather was my age when he went to war. I can imagine deciding that some things are worth fighting for and going into the abyss. Those letters are heart-wrenching. I imagine if my mother or my daughter were in a battle with me, I would spend all my time trying to protect either of them. Love this post and I do think you need to do an actual walk to these places. I'll meet you there in 2017, what say? I'll post a Dreaming of France meme on Sunday night/Monday so we can play one last time in 2016. This is indeed an adventure. 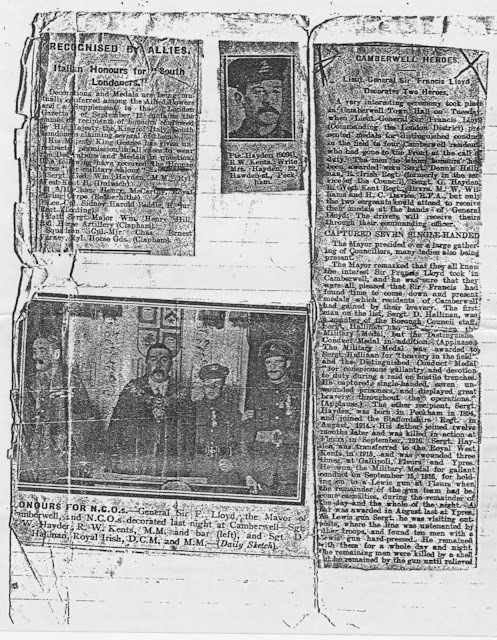 A mystery and a family history. I am loving all of it. What a sad time that was. It's great you are recording all this research.